CirclelensesEurope.com are certified retailers of Geo Medical and EOS - Eye Of Seduction in Europe. GEO Medical is a world leading company in both creating new exciting designs aswell as manufacturing colored contact lenses with the highest standard on the market. 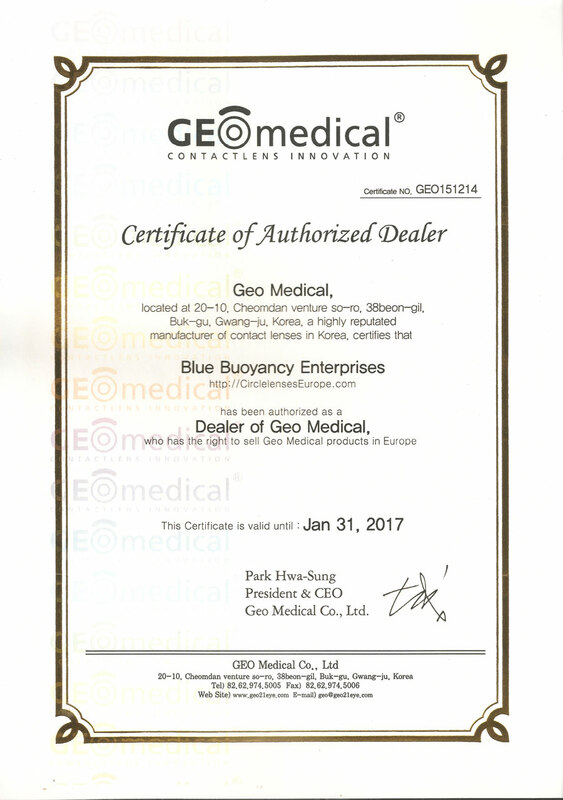 GEO Medical is also one of the few lens companies on the market that are ISO certified, CE marked for the European market, GMP -marked and FDA approved on several continents. In the process of manufacturing, GEO Medical uses a technique called "sandwich -printing" in order to increase the safety for your eyes. The process ensures that the final customer receives a product that is safe to use. Read more about "Sandwich Printing Technology"
EOS - Eye Of Seduction is also a world class manufacterer of circle lenses and colored contact lenses with the highest standard on the market. 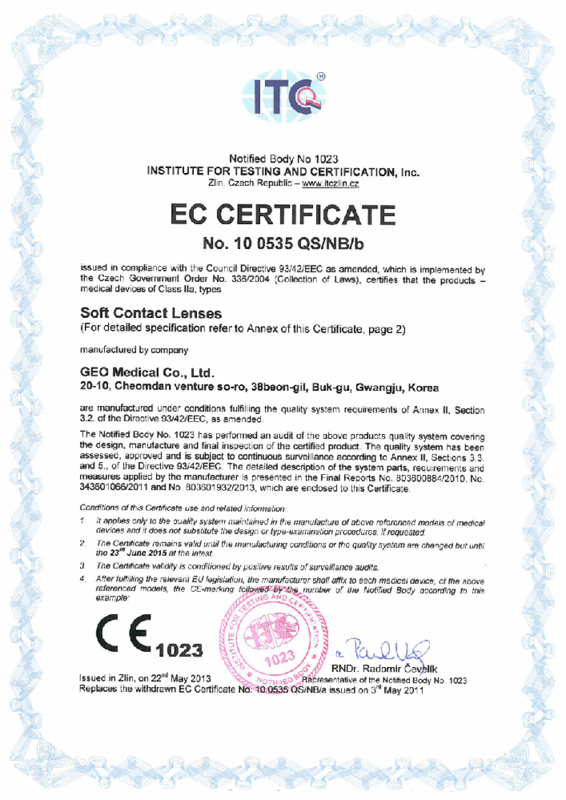 With its popular lensdesigns EOS are ISO certified, CE marked and KGMP -marked. In the process of manufacturing, EOS also uses the"sandwich -printing-technique" when manufacturing and dyeing the lenses in order to increase the safety for your eyes . The process ensures that the final customer receives a product that is safe to use. Our Certification ensures your safety and we can therefore assure that you are getting authentic lenses when you shop from us, which gives you a security in a market flooded with cheap copies. 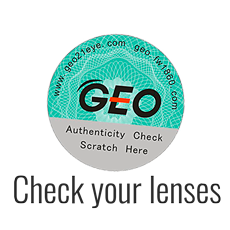 All of our lenses from Geo Medical come with an authenticitycode so that you easily can check your lenses. You find the Code on the sticker on the side of the lensvial from GEO. Read more about our Authenticity Guarantee. 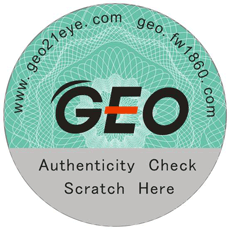 Find the GEO-sticker on your products from GEO Medical and get your unique authenticitycode. Press on the sticker below and follow the instructions. To ensure that the products sold are manufactured in accordance with current requirements and to ensure the highest quality, there are different kinds of certifications and labels for the purpose. All our suppliers of lenses are approved by the Food and Drug Administration (FDA), KFDA or GMP, ensuring accurate manufacturing and the medical quality of the products that we sell in accordance with existing regulations. Our suppliers with its products are GMP and ISO 13485 certified, which means an additional quality management system for existing products. FDA Food and Drug Administration is a control organ which basically is responsible for "protecting the public health by assuring the safety, effectiveness, quality, and security of human and veterinary drugs, vaccines and other biological products, and medical devices." FDA labeling implies that the country controls the manufacture and handling of the products. The FDA allows testing to ensure the medical quality of the products and that production takes place in sterile environments. 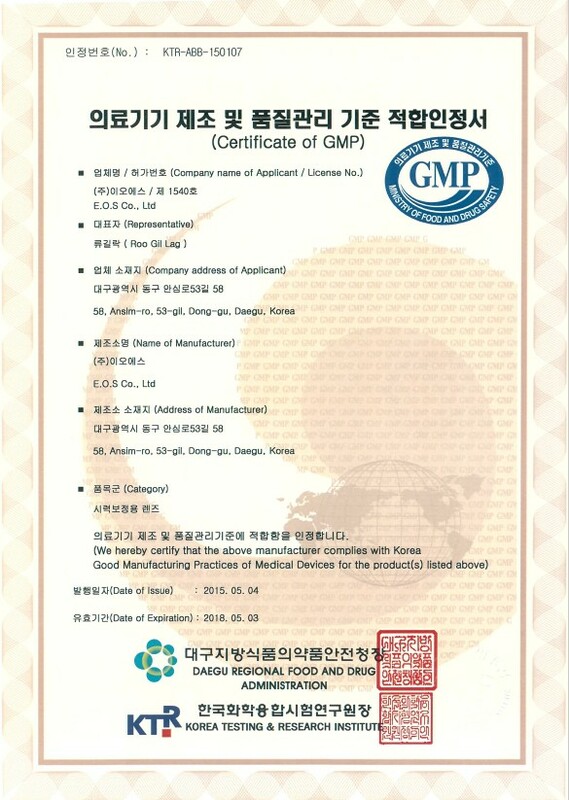 KFDA is Korea's equivalent, accounting for Korean Food and Drug Administration. and GMP for cosmetics is equivalent to that of the drug and will require the complete traceability of the entire process of manufacturing with full documentation. The label provides the consumer the security that the product is of high quality and class.